Green Arrow: Year One (the scenes on Lian Yu), Green Arrow: Quiver (the concept of a hero coming back from the dead without a soul), The New 52 Constantine series (John traveling the world retrieving magical artifacts so bad people don't get them) and the late, lamented Constantine TV series (Matt Ryan's characterization of John Constantine and a few other Easter Eggs). Laurel's being angry at Ollie for never telling her about Thea and the Lazarus Pit is illogical in the extreme. That being said, one wonders why the subject never came up when Thea, Digg and Felicity came back from Nanda Parbat without Oliver back when he was training to take over the League of Assassins near the end of Season 3. You'd think one of them might have mentioned the magic hot tub to Laurel then and precisely why Oliver didn't come back. On that note, while I can understand that the writers' need to make sure death still means something on this show and explain that they can't just dunk anyone who dies in the future in the magic hot tub, one wonders why - in universe - they named The Lazarus Pit after a Biblical figure who came back from the dead if it isn't meant to raise the dead. Laurel seems to shift gears on wanting to kill Sara as opposed to saving her awfully quickly. Ignoring that, how did she gear up in the Arrow Cave with a loaded gun without anyone saying something earlier? Matt Ryan is a delight as John Constantine and has great chemistry with Stephen Amell. Hopefully The Powers That Be will find a way to bring him back for future episodes. Maybe just in time for the final showdown with Darhk? Please? While Willa Holland doesn't usually get a lot of great moments, she does shine in this episode. Her fight scene with Caity Lotz and sparring with Stephen Amell show how far she's come as an actress from just being the kid sister to being able to handle some intense stunt work. And the moment where Thea's ready to sacrifice herself to bring Sara the peace she can't ever have is understated yet powerful. It never occurred to me until this episode that we never really got to see John Diggle and Quentin Lance interact that much one-on-one. David Ramsey and John Blackthorne do a great job playing off one another and one wonders why nobody thought to put their characters - peacekeepers and fathers who have gone far afield from what their oaths and uniforms require - together in a scene. Again, Caity Lotz does more with a few smoldering gazes and garbled Arabic than most actresses can with a monologue meant to convey more emotions than blinding rage. The fight scene between Thea and Sara is very well handled. The special effects for John's magic, while limited, are effective. Much like John's magic in the comics, fittingly enough. Alex Davis refers to the Sara Lance's death and the sinking of The Queen's Gambit as Oliver's personal Chappaquiddick. Though he is not named directly in the episode, the Chappaquiddick Incident effectively killed the Presidential ambitions of Senator Ted Kennedy. Thea thinks Chappaquiddick is "that game from Harry Potter". She is thinking of Quidditch - a rugby-like game that is played on flying brooms. John Constantine is an anti-hero magician from DC Comics and Vertigo Comics. Created by Alan Moore as a supporting character during his run on Saga of the Swamp Thing, John proved popular enough to inspire his own solo series - Hellblazer - which started out as a DC Comics book but became one of the flagship titles for the adult-oriented Vertigo imprint. Hellblazer remains Vertigo's longest-running series, having lasted 300 issues. John current stars in the DC Comics series Constantine The Hellblazer. John also starred in his own sadly short-lived TV series called Constantine. The show had a rabidly loyal fan base who trended the #SaveConstantine hashtag at numerous points when the show's fate was still up in the air. This fan base included actors William Shatner and Stephen Amell. Matt Ryan, who plays John Constantine in this episode, also played John Constantine on Constantine. His casting in this episode - and indeed John Constantine's involvement in the story - may have come about because Stephen Amell lobbied to have the blue-collar magus make an appearance on Arrow with Matt Ryan in the role when Constantine's fate was still in doubt. Green Arrow and John Constantine have only met once before in the comics. In Green Arrow #25, Oliver is hired to track down a young noblewoman - a practicing Wiccan who has retreated into the local woods after death threats from locals who blame her witchcraft for their troubles. Oliver agrees to take the job for one reason - the local woods in question are Sherwood Forest! Before entering the woods, Ollie asks for directions at a local pub and a certain trenchcoat wearing man warns Ollie about there being dark powers in the forest. The theme from Constantine is played when we first see John Constantine in the flashback scene. John's motivations in the flashback are much the same as in the New 52 Constantine comic. There, John traveled the world, looking for powerful magical artifacts and taking them before they wind up in the wrong hands. When Felicity is surprised that Curtis works out, he reveals that he was an Olympic decathlete and won the Bronze Medal at the 2008 Olympics. The comics version of Mister Terrific was also an Olympic decathlete, though he won The Gold Medal. John makes a reference to Alice In Wonderland, when he addresses Ollie as Alice and tells him to go down the rabbit hole (i.e. the trap door he just uncovered). When we first see John in the modern day, he is stomping out a cigarette. This is a clever nod to John's chain-smoking in the comics, which could not be portrayed on American television due to the rules against depicting casual tobacco use. They used this trick on the Constantine show to suggest John's nasty habit even if they couldn't show him actually smoking. We get a quick close-up on John Constantine's business card. It's the same one from the Constantine show. If you call the number on it - (404) 248 7182 - you'll get John's rather rude answering machine message. John makes reference to Oliver being surrounded by a lot of beautiful women and says he would have paid a visit had he known. In the comics, John is a notorious flirt. He's also bisexual, so it's curious he doesn't include John Diggle among the pretty people. Constantine has Felicity bring him a dead peacock's feather to use as a back-scratcher. The symbol of the NBC network - which canceled Constantine - is a peacock. The artifact that John retrieves from Lian Yu is known as The Orb of Horus. While there is no such artifact in the DC Comics Universe, Hawkman has made use of a magical gauntlet called The Claw of Horus, which gives him strength enough to knock out Superman with one punch. There is also an artifact called The Orb of Ra, which transformed Rex Mason into the superhero Metamorpho. The device Dhark gives Quentin is a RAT - A Remote Access Trojan. A computer virus with polymorphic code designed to target and erase certain pieces of data, wrapped in three layers of encryption. Oliver uses a tranquilizer arrow to knock out Sara. An exorcism is a ritual to remove demonic possession. A restitutionem is a ritual to restore a soul to a living body. A grimoire is a word meaning spellbook. Conklin: Look, we've been on this island eight months without a single problem. He shows up; suddenly two guys find landmines and a whole bunch of drugs go missing. Oliver: (sarcastic) Yeah, Conklin? You got me! I didn't wash up on shore here after a boating accident. I parachuted in on a secret spy mission! Conklin: You wanna die a liar, that's fine by me. Oliver: (scoffing) Man, that's enough. Reiter: Enough! There are more pressing matters at hand. Perhaps if you were more focused on external matters than... witch hunts, you would have caught this man spying on us in the fields. Constantine: Any of you squabblers got a cigarette? Quentin: What do you want?! Damien: A new beginning for the world. A nice glass of Merlot. Not necessarily in that order. Felicity: (over the PA system, in a sinister voice) This is your overlord, Felicity Smoak. Thea: We have a PA system? Oliver: Yet another decision I might live to regret. Oliver: Your sister's alive. She's out there. And she's hurting people. How is she alive? (pause) The Lazarus Pit? Did you two spend your spa weekend at Nanda Parbat? Thea: (weakly with a forced smile) It was the only place we could get a reservation? Oliver: The blood lust is worse with Sara, isn't it? Because you brought her back from death. Laurel: Yeah, and that's not the only problem. Sara's not herself. She's changed. Laurel: (sarcastic) Come to you for what? Your expertise on magical resurrection? Or that judgmental look on your face? Oliver: (exasperated) For help finding her, Laurel! Before she gets hurt? Or she hurts anyone else? And if I have a judgmental look on her face right now, it's because you played with forces that you don't understand and now people are dying because of it! Quentin: We need to talk. Quentin: You've got to admire her consistency. Keeps her death secret from me. Keeps her resurrection secret from you. Constantine: There are things on this island that bad people shouldn't have access to. Oliver: Says the guy with a gun pointed at my head! Constantine: (chuckles) Oh, I'm not a bad guy. A little hard scrabble, sure., but uh, I'm on the side of the angels, mate. At least when they're not busy trying to screw me over. Oliver: I don't understand. How did you-? Constantine: Well, that's the great thing about magic. It can't be explained. There are places in this world as old as the world. Places of nexus. Draw bad people to them. This island is such a place. It's no accident that you're here. Oliver: I'm not a bad guy either. Constantine: (answering the phone) Oliver. Constantine: It's been a dog's age, mate. Oliver: More than. You remember that favor you owe me? Constantine: I hardly expect you to let me forget about that. Oliver: How quickly can you get to Star City? I need your help. Constantine: You know, if I knew you were surrounded by so many pretty girls, Oliver, I would have stopped by sooner. Diggle: I hate to be the one to say this, but what if something goes wrong? Constantine: Oh, don't worry. If things go wrong then we'll all be too dead to care. Felicity: I think I got everything in here that you wanted, although I am not entirely sure what you need a dead peacock feather for. Constantine: Ahhhhh! Oh, nice one! That's been bugging me for hours. Oliver: Thea, I don't have the right to feel mad at anyone for keeping secrets. But I'm sorry I made you feel as though you had to. Lance: You don't have to read this. You can remember your brother how you knew him. Diggle: Are you sure about this? Lance: Yeah. It's legit. I'm very sorry. Lance: A gut punch doesn't deserve a thank you. Ray: I'm alive and I'm in trouble. Laurel: Hey! I didn't tell you that I took my sister to Nanda Parbat because I knew that you wouldn't approve. Why didn't you tell me that you took Thea? Laurel: It's the hypocrisy I can't stand. What? It's okay for you to do whatever you have to for your sister but it's not okay for me to do the same for mine? Oliver: Sara was dead. Thea wasn't. Laurel: Then why didn't you tell me about Thea seven months ago? Laurel: Because you don't see me as an equal. Oliver: What?! Oh, come on... Laurel, of course I see you as an equal. Laurel: No you don't! You never have! You never told me that you were the Arrow! You never supported me becoming the Black Canary and you never would have told me that there is a way to save my sister. My sister is half out of her mind right now. Because of something that I did. A decision that I made.. Did you ever just stop and think for one second about what I might be going through? Alex Davis is hired by Thea as a political strategist for Oliver's campaign. His first bit of advice is for Oliver to distance himself from Laurel because of the potential negatives associated with Sara's death while at sea with Oliver. Alex makes reference to Bethany Snow - the news anchor on Channel 52 - who is set to do Oliver's first major interview. Sara is revealed to have only been killing muggers and street thugs and attacking women who resemble Thea Queen in the Pennytown district of Star City. As of the first attack we see at the start of the episode, she's killed five men. Laurel refers to Quentin nearly killing Sara in the last episode. Thea refers to when Laurel took her in to do her community service with CNRI in 112. Both John Constantine and Ollie know how to slip out of a pair of handcuffs. Laurel is still attending AA meetings. Thea finally tells Oliver and Laurel what Malcolm told her in 403 about how her blood lust requires regular deaths to keep under control and how she would have to kill Ra's in order to find peace. This also means that Sara, to find peace, must kill Thea. Oliver's first encounter with magic is John Constantine working a spell to reveal a hidden trap door. Oliver confirms once again that while The Lazarus Pit can restore a body, it cannot restore a soul. Sara seems to have some ability to psychically track Thea, due to their connection as Lazarus Pit users. Oliver saved John Constantine from a death trap in the underground caves of Lian Yu. This is why Constantine owes Oliver a favor and why he agrees to help perform a ritual to save Sara's soul. Andrew Diggle was some manner of crime lord in Afghanistan. His activities brought him into conflict with HIVE, which is why they hired Deadshot to kill him. John's list of things he needs for the restitutionem is written in Aramaic. Felicity is still able to translate it. The dreamscape in which Sara's soul is being held looks like Nanda Parbat, with Sara being held down inside The Lazarus Pit and Oliver, Laurel and Constantine having to fight League of Assassins members to free her. 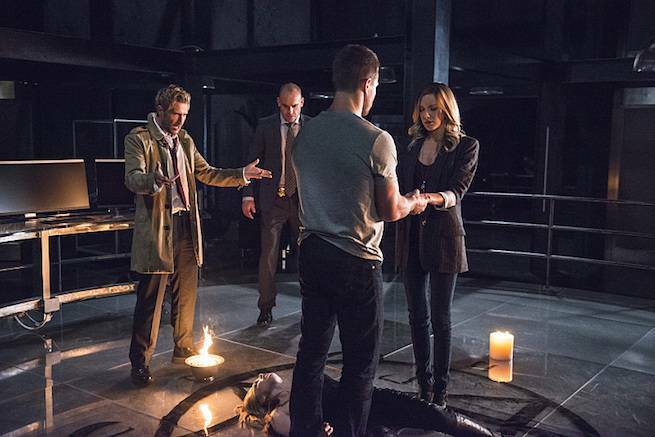 In this dreamscape, Laurel and Oliver are in their superhero costumes without masks while John is in his usual trenchcoat, white dress-shirt with red tie and black trousers. John works a "guide spell" that allows him to find the way to where Sara is being held in the dreamscape. John knows how to fight with a sword, but not very well. John casts a spell that paralyzes the assassin he sword-fights. Sara's is clad in what appears to be a white version of her Canary costume in the dreamscape. Oliver says he'll be there whenever Constantine needs his help, though John considers their debts squared. John says he can live with that. Constantine has heard of Damien Darhk and advises Oliver to get out of town while he still can. Thea admits to finding Constantine attractive. though she may be joking to annoy Oliver. The artifact that John retrieves from Lian Yu is known as the Orb of Horus. It is a grimoire - a spell book. John offers to help Ollie off the island but Ollie refuses, saying he needs to rescue the people Reiter is holding as slaves. In the flashback, Constantine transfers some kind of magical tattoo from his right arm to Oliver's chest. He claims this will give Oliver insurance against Baron Reiter and that Oliver will know how to use it when the time is right. Oliver goes against Alex Davis's advice, and has Laurel there as he gets ready to do his first interview. We do not get to hear all of the interview, but Ollie is overheard on the radio speaking about how he will not run from his past. Quentin gives Diggle a folder full of classified information on his brother's crimes. Ray Palmer is revealed to be alive and in trouble after Curtis Holt cleans up his last transmission. As Quentin and Diggle break into the federal data bank, Lance asks if Diggle learned how to break in and enter before or after he teamed up with Oliver. Diggle says they'll save that for another story. Constantine says that he has performed a restitutionem once before, a year earlier. This does not seem to be a reference to the Constantine show since - while John did many things to save a number of lost souls - none of them involved a ritual to restore a lost soul to a living body. With this episode, Laurel is pretty much confirmed to be the worst person in the world. She admits that the only reason she didn't go to Ollie for help is because she knew he'd object to what she was doing. She further accuses him of being hypocritical because he used The Pit to save Thea but it's somehow wrong for her to do the same for Sara. She's also mad that Oliver never told her about Thea being restored by The Pit. Ignoring that The Pit isn't meant to be used on the dead (something Ollie points out in his comeback to Laurel), Oliver was on something of a deadline when Thea was nearly killed and didn't have a chance to tell Laurel everything since he had to stay in Nanda Parbat afterward. What this episode neatly ignores is that while Laurel accuses Ollie of not seeing her as an equal, Laurel is confirmed to think so little of Oliver and his capacity to feel empathy for others that she thinks he'd sit on a fool-proof method of bringing back the dead! Oliver has lost far more loved ones in the past few years than she has. Does she really think Oliver wouldn't have used this magic to bring back his parents back if he could? Or his best friend, Tommy Merlyn? And there's the ultimate punchline - Oliver spends more time mourning the loss of Tommy in this episode than Laurel does and Laurel was Tommy's girlfriend! So in summary - Laurel Lance is an awful person. Ultimately, the flaws with this episode involve what was left out rather than what was left in. Every moment Matt Ryan is on screen as Constantine is magical - pun very much intended. But the subplots with Ray Palmer being discovered alive, Thea's continuing issues and Diggle discovering the truth about his brother are given less screen time in favor of trying to resolve all of Oliver and Laurel's baggage. Granting there's a lot of material there that has been neglected by the writers for a long time, none of Laurel's complaints about Oliver read true and Katie Cassidy's performance fails to sell any of it. Had more time been given to Diggle and Captain Lance playing off one another, Thea coping with her blood lust and her role in Sara's death, Felicity bantering with Curtis or heck - Sara being give a chance to speak after being restored, body and soul in place of Laurel whining about Ollie not respecting her, this could have been a much stronger episode.